Van Du gate village in the suburb of Hanoi. Duong Lam gate village in Hanoi. Since ancient times, the village gate has served as more than just an entrance or exit. Many villages have more than one gate, each facing different directions. Originally, these may have been made of spiked bamboo to prevent wild beasts from entering. Later, they became part of the general defense against any intruders. 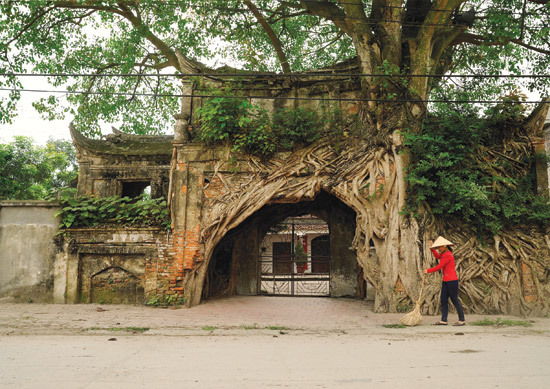 In the flourishing middle Le Dynasty, the gates were built stronger, longer lasting, and more beautifully with materials such as bricks, stones, laterite, and lime mixed with salt and honey or cane sugar. In many places, the gate has strong wooden doors, which only opened at a certain times, as deemed necessary by the village. Some even have moats on both sides, and were reinforced with bamboo inside, like a barricade. 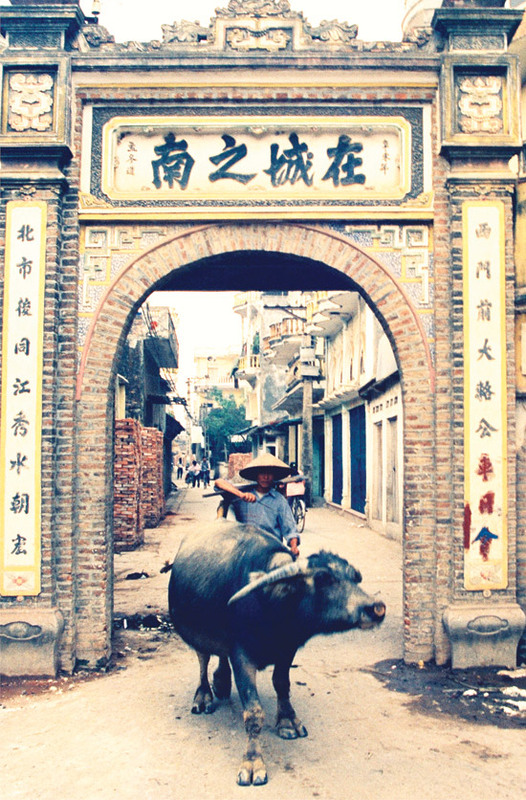 Before 1945, Hanoi and former Ha Tay had about 1500 villages with multiple gates. Time and wars have destroyed many of these. 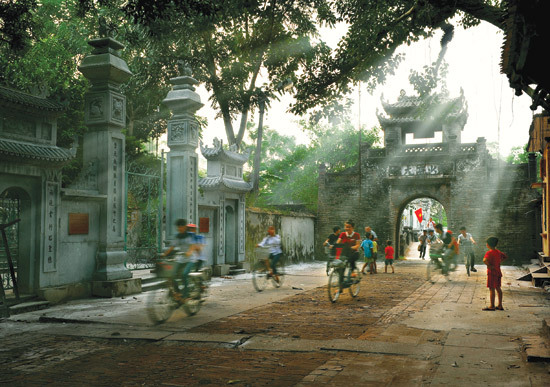 But the remaining gates, such as those of Uoc Le village in Thanh Oai, Chi Quan village in Thach That, Mong Phu village in Duong Lam, and Son Tay are truly cultural legacies left by the previous generations. An important part of a gate is the top, which is often built in the form of an arch. The arch is usually covered, so travelers can hide from the tropical sun and rains. In many places, there is a floor or two on top of the arch, each adorned with boat prow-shaped roof corners, like those of temples and pagodas. On each sides of the arch, there are tall pillars, with reliefs of parallel sentences, designed to introduce the village’s good traditions. Some gates, besides the big entrance, have two smaller side doors, like those at pagodas. 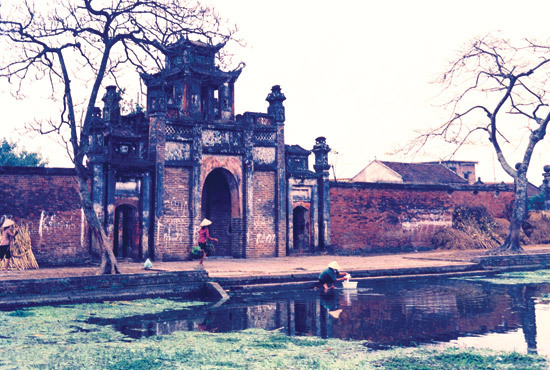 Some gates have a room on top of it, like those of Thach Than village in Quoc Oai, Lai Xa village in Hoai Duc, and particularly, the gate of Mông Phụ village in Duong Lam, built during Lê dynasty. The front side of the gate is the most important. There is a relief of a seal, with flowers and leaves, and above the gate, a relief of the village name or slogan which shows the villagers’ aspirations. For example, Uoc Le village gate, one of the most beautiful ones in the North, has a big relief of the village name. 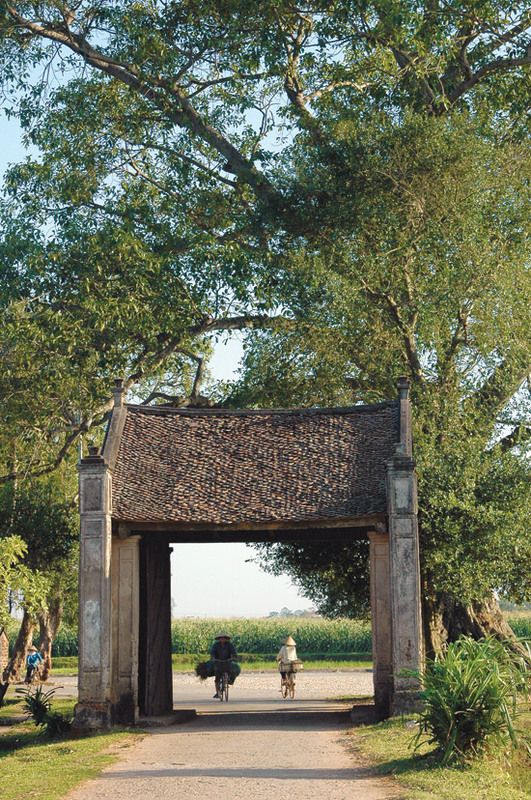 Phung Xa village gate has two big characters; ‘Loyalty and Righteousness’. Ha Tri village gate has: ‘Good traditions preservation’. Many villages have the three characters for ‘Mankind for beauty’, meaning that beautiful human qualities are the highest values. Many others have the three characters for ‘Little Tall Big’, which were taken from the story about a high court mandarin named Vu Dinh Quoc, who told his descendants to make the village gates higher and bigger so that horses and carriages could pass through. It expressed the wish that the village’s descendants study hard in order to have a successful career.